Home Dogs’ Tails Tell Tales So Let’s Listen! “But I don’t understand why she bit me, Doc! She was wagging her tail the whole time…” If I had a dog biscuit for every time I’ve heard this lament from a client, I could open up my own doggie bakery! From the time we were small, most of us have been taught that a wagging tail means a friendly dog, and some of us have unfortunately learned the hard way that this is not always the case. A dog’s tail is a very important part of his or her communication system, serving sometimes as a beacon (“Come see me!” or “Keep petting!”) and sometimes as a warning (“Proceed with caution!” or “Back away!”) Dogs use their tails to communicate with each other and also with us and an understanding of what a tail can tell can sometimes prevent a dog bite. After all, if we all learned to read dogs’ body language expertly, dogs wouldn’t need to rely on ever more dramatic forms of communication for us to get the picture! From a distance, a dog’s tail can convey its size, and size matters an awful lot in the animal kingdom! Whether in communications between predator and potential prey or between members of the same species, a bigger animal is often a safer animal. Thus, when dogs see each other from a distance, many of them raise their tail high above the line of their back, into an arc shape and wagging stiffly. In fact, it’s been suggested that many mixed-breed dogs have evolved markings that include a different colored tip to their tail precisely because this salient flash of color serves as a marker of a dog’s size from a distance. As dogs approach one another or us and interact more closely, other signs become important in communicating the dogs’ intentions. Let’s review two telling tail features that we should be tuned in to. Tail height. We should pay attention to how high the dog is carrying his tail. As mentioned above, dogs often carry their tail high when trying to convey size. This reflexive attempt to look bigger is likely to arise in situations where a dog is unsure about what’s to come (e.g., when approaching an unknown dog/person or when unsure how another dog/person is going to respond in a greeting situation.) If a dog continues to hold her tail high and stiff during a greeting, it may convey a general unease with the interaction or a readiness to become aggressive. When the tail is held low or tucked between the legs, most of us recognize that a dog is timid or frightened. 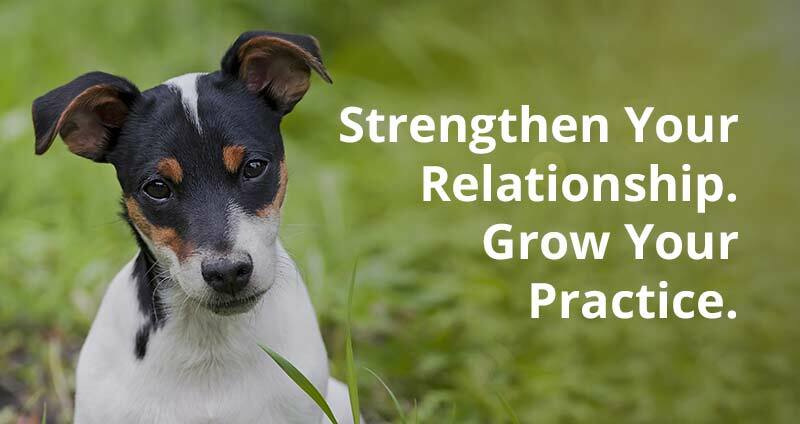 This might be seen in a puppy when first meeting new adult dogs or in dogs with a limited socialization history when meeting new people. It also can be seen in otherwise relaxed dogs who suddenly become frightened. The low tail is designed to communicate that the dog is no threat but is at least mildly uncomfortable. If a person continues to interact with an overly fearful dog, the dog may feel the need to move to other defensive responses, which can include snapping or biting. A tail that is carried somewhere in the middle, especially when swishing side to side with a wiggle to the hip signals friendly intentions and an interest in greeting. Because the swish of that tail is so important to an understanding of intention, let’s move right into the second telling tail sign. Tail movement. When a tail is stiff and held high, in what is called the flagpole position, we should proceed with caution, as this may indicate the possibility of aggression. In fact, this is the tail position most commonly associated with the misunderstanding I started with above. Specifically, a person may pass a dog on its property who is standing with flagpole tail and the tail might even be “wagging” stiffly side to side. If the person continues to approach or tries to pet the dog, the dog may move to growling, barking, snapping, or biting. From the dog’s perspective, the stiff and high tail was meant to communicate something like, “Stay where you are or continue on your way – I am uncomfortable with your presence!” If the person sees a stiff wag in that tail and assumes the dog wants to say hello, the dog may feel compelled to use other (sometimes more aggressive) ways to communicate. The ideal tail wag we should be looking for if our intention is to pet a dog, or that we hope to see when dogs are greeting each other, is the swishy wag that is either soft and relaxed with the tail in a flattened “S” shape behind the back or so wiggly that the whole back end is moving side to side along with it. This latter tail wag is the one we’re most likely to see when our own dogs greet us or when most puppies greet, well, anyone they meet! As dogs mature into adulthood, some become more selective in their full wiggle presentation, saving it for those they are closest to, while other dogs spend a lifetime wiggling for anyone who might even consider reaching down to pet them. 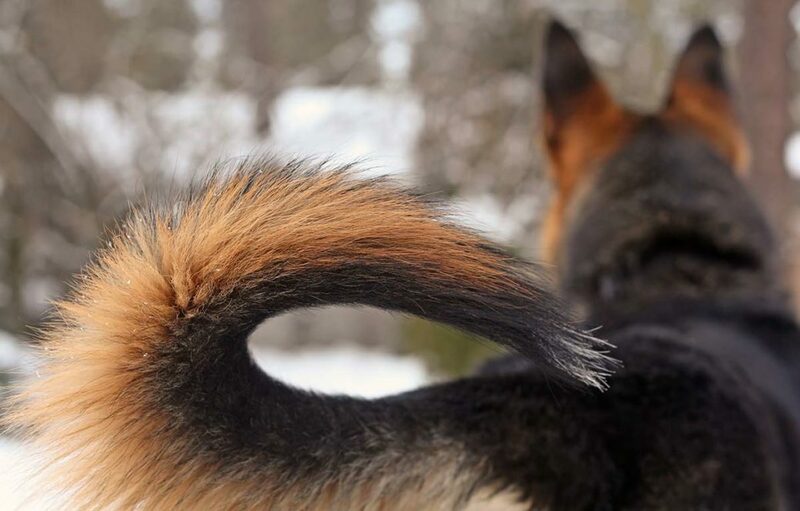 We must also consider that, through breeding or tail docking, some dogs have tails whose shape makes it more difficult to read (e.g., a Pug’s corkscrew or a Husky’s sickle-shaped tail) while other dogs have no tail at all! In these cases, we must look to other body language indicators to understand a dog’s intention. We will turn to some of these indicators in next month’s column. In the meantime, keep in mind – a tail has a tale to tell and our dogs sure hope we are paying attention!